Cloud-Capped Star is the first film in Bengali director Ritwik Ghatak’s trilogy about the partition of Bengal in 1947 and its aftermath. It could be argued that all of Ghatak’s features between 1952 and 1977, when his last work was released posthumously, were concerned with the partition, but it is the trilogy that has been most widely seen outside India. E-Flat (Komal Gandhar, 1961) and Subarnarekha (1962, but released 1965) are the other two films in the trilogy. Cloud-Capped Star and E-Flat were shown at HOME in Manchester as part of an Indian Partition Weekend in June. DCPs have been struck by the National Film Archive of India. Cloud-Capped Star is also available as a DVD from the British Film Institute. The narrative structure of Cloud-Capped Star is seemingly straightforward. We meet a family from East Bengal living in a refugee ‘colony’ on the outskirts of Calcutta in the 1950s. The father is a teacher now struggling to get work and the mother has become something of a harridan in her disillusionment. The eldest son Shankar (Anil Chattopadhyay) is a trained musician but idle and like everyone else in the family seems to exploit his sister Neeta (Supriya Choudhury), the only one with a regular income. Neeta’s younger brother Montu wants to be a footballer and her younger sister Gita seems most intent on getting a boyfriend. The narrative then plays out as the tragedy of Neeta. She will see the prospect of her own marriage disappear, losing the possibility of marrying a man who eventually ends up with Gita. Neeta’s selflessness will bring about her downfall – she catches TB (from lack of proper food and exhaustion from over-work?). Shankar does finally make the effort and moves to Bombay where he becomes a successful singer. But when he returns he is faced with his sister’s decline. Like many Bengali films, Cloud-Capped Star is based on a novel – in this case by Shaktipada Rajguru. A classic noir melodrama composition. 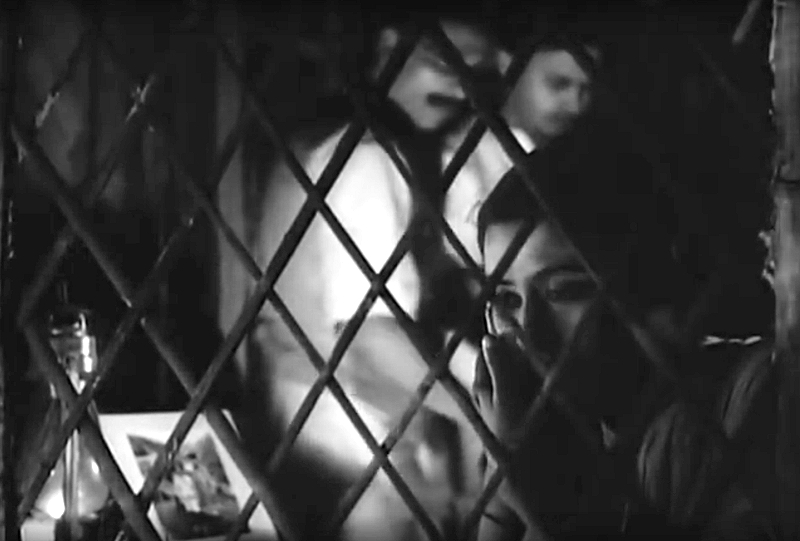 Neeta (Supriya Choudhury) is seen here through a window into her room, behind lattice-work, with her father and brother in the background representing the pressure on her as bread-winner. N.B. These screen grabs have been cropped because of technical problems. Cloud-Capped Star is not about plot, it’s about the artistic presentation of loss and the consequences of partition. This is a true melodrama with meanings expressed through music, sound effects, framing, composition and mise en scène. Meanings are also expressed through editing. Although this was Ghatak’s most successful film with the Bengali public it’s not because the film follows mainstream conventions. It’s because of the tragic story and the portrayal of Bengali culture. The film certainly is a melodrama but its ‘excess’ is not about beautiful colours or lush music. 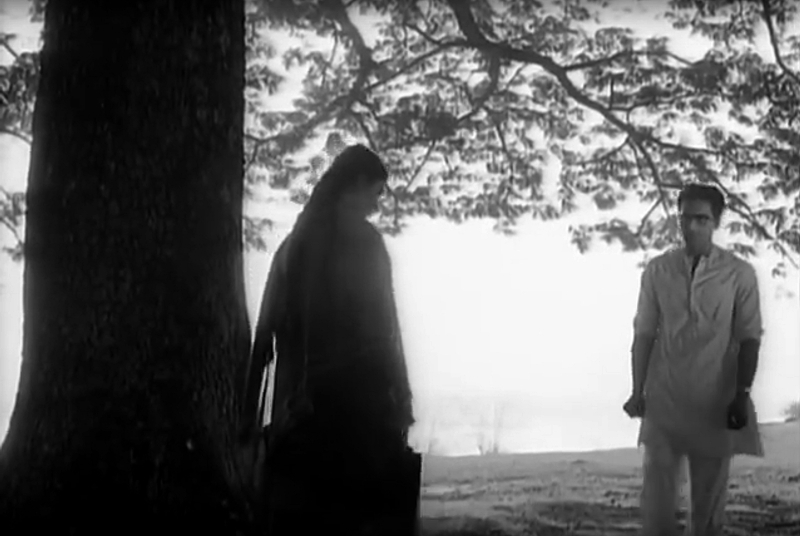 In his monochrome film Ghatak uses noirish lighting for interiors contrasted with the brash sunlight outdoors. The editing ‘chops’ the end of scenes and ‘throws’ us into the next. Some of the beautiful music in the film is undercut by strident sound effects. Neeta at the point when she first realises that she might have TB. There are several low-angle compositions in the film and here the camera angle enhances the expression in her eyes and her gestures. The geography of the Bengal Delta is confusing for outsiders – especially since the rivers that break away from the main Ganges-Brahmaputra to form the fan-shaped delta are given different names by different communities and are now separated by the boundary between West Bengal and Bangladesh. Ritwik Ghatak grew up along the Padma River, one of the rivers of the delta now in Bangladesh. Kolkata (Calcutta) stands on the eastern bank of the Hooghly River. The refugee ‘colony’ in Cloud-Capped Star is close to the river (presumably the Hooghly?) 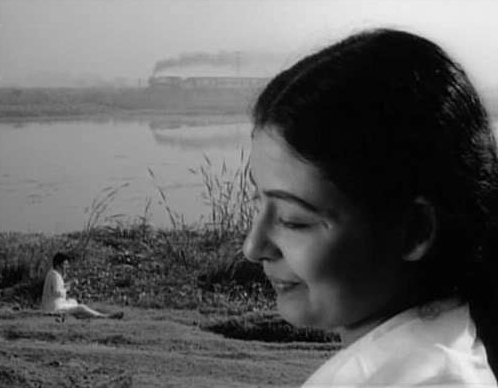 and it is the river bank where Shankar goes to sing and where Neeta walks beneath the great line of trees at the beginning of the film – and where later she meets Sanat (Niranjan Ray), her would-be fiance. Ghatak’s camera, in the hands of Dinen Gupta, composes the images of Neeta and Shankar carefully. They are first brought together with Neeta in a close-up in the foreground to the right of the frame and looking left. In the middle ground is Shankar (looking to the right) and beyond him, first the river and then on the other bank in the distance is a train travelling from right to left (see the image at the start of this posting). Neeta in this sequence is placed above Sanat in the frame – a signifier of her moral superiority? 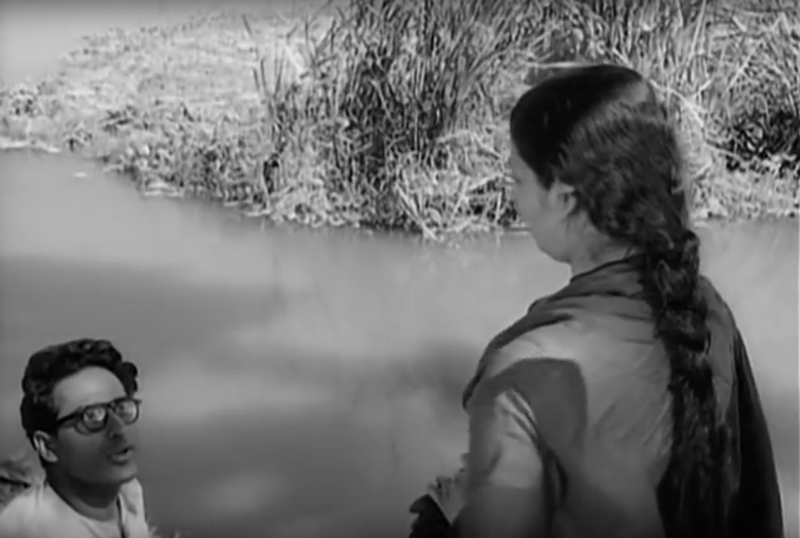 Later in the film, when Neeta meets Sanat by the river it is soon after the crisis point when, having lost Sanat to her sister, Neeta has to ask him for money to pay for Mantu’s hospital expenses – and she herself is showing the signs of TB infection. The long shot above follows a meeting on the footpath beneath the trees at which point Ghatak develops a complex soundtrack mix. The melodious music and background natural sounds of cicadas are suddenly undercut by a wailing sound that could be the engine whistle in the background, but which lingers on as a peculiarly alien sound. At this point, Neeta invokes a sense of despair that she hasn’t confronted injustice and Sanat seems to admit he was wrong to give up his studies and take a job when he could be continuing as a political activist. In Cloud-Capped Star, Ghatak presents the decline of Neeta’s family as a metaphor for the decline of Bengali culture post Partition. Is it important that the locomotive pulling the train in the background is travelling ‘tender first’ – effectively ‘backwards’? My perhaps rather simplistic reading has Neeta, the most active member of the family who sacrifices her opportunities to use her artistic talents in order to put food on the table for her family, eventually being sacrificed herself. Neeta represents the potential for a new Bengali society that cannot flourish after Partition. Ghatak’s emotional but also analytical storytelling drenches events with music, sound effects and references to poetry scattered through the dialogues. His camera creates complex framings of equally complex staging of actions. The film for me is literally ‘shocking’ in its excess and its cutting – ‘shocking’ in two senses, firstly in its harshness and abruptness and secondly in its disavowal of the conventions we have all too easily internalised from mainstream cinema. The French film theorist Raymond Bellour has produced a detailed, illustrated reading of the whole film that can be found here. As Bellour, quoting Serge Dany, avers, it is indeed one of the greatest of all melodramas. The title may refer to a line from Shakespeare – The Tempest. It may equally refer to the mountains visible from the sanatorium near Darjeeling where TB takes Neeta. I’ve watched Cloud-Capped Star two or three times and still I haven’t seen everything it has to offer or understood all its meanings. I’m also completely at a loss (because of my lack of musical knowledge) to fully get to grips with Ghatak’s use of music in this film (which includes a song using Rabindranath Tagore’s poetry, I think). He was undoubtedly a great filmmaker, not properly appreciated during his relatively short career but influential through his teaching at FTII in Pune in the mid 1960s and globally through his writing on cinema and archive screenings of his films for various filmmakers ever since. Here’s one of the songs in the film.It comes during a sequence in which Neeta comes home and confirms that Montu has left college and has taken a factory job. He is too ashamed to tell his parents and Neeta here offers his first wage to contribute to the household. Her mother is unreasonably angry with Neeta. Both Neeta and Montu are going to suffer. At the start of the clip, Shankar gets a razor blade for a shave and is shamed by the shopkeeper who tells him it is disgraceful that she has to support the whole family. He thinks of her as being like Sinbad the Sailor – carrying the Old Man of the Sea (i.e. her family) on her back. Screenings of Cloud-Capped Star are possible as part of the Independent Cinema Office’s India on Film Tour celebrating 70 Years of Independence in August. Look out for screenings around the UK. This entry was posted in Bengali Cinema, Indian Cinema, Melodrama and tagged Indian Parallel Cinema, Indian Partition, Ritwik Ghatak. Bookmark the permalink.